If your room has a reach-in closet, chances are it’s smaller in size. That means you need to use every inch of space as efficiently as possible. One way to do this is to transform your room’s basic built-in features into functional elements. For instance, you can eliminate the need for a stand-alone mirror by installing a full-length mirror on the back of your closet door. You can also install sliding doors with mirrors to maximize your space while enjoying the luxury of large, high-quality mirrors inside your space. Reach-in closets are equipped with basic railing systems, which are great for hanging clothing such as dresses, blouses, suits, and jackets. But some clothes, including sweaters and pants, are best stored on shelving to reduce wrinkles, creases, and prevent them from stretching out. Custom closets with built-in shelving will allow you to more efficiently store your clothing while creating more room inside your smaller closet to store your belongings. Custom shelving can also be made to display and organize your shoe, hat, and handbag collections. Take advantage of your railing system by turning it into a double rail. Chances are that your railing system is installed near the top of your closet, leaving plenty of room below. By putting a rail underneath the top rail, you can double the amount of space to hang clothing. Double railing and custom closet organizers will also allow you to better organize and sort your clothing. For instance, you may decide to hang blouses and shirts on the top rap, and jackets and blazers on the bottom rail. 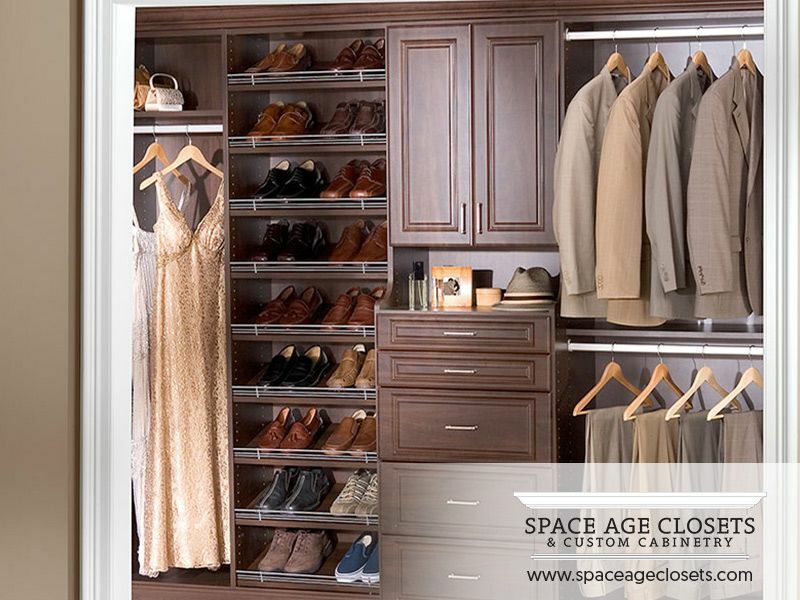 No matter the size of your room or closet, Space Age can help maximize the potential of your space with our custom closets, custom closet organizers, and custom shelving. For over 30 years, we’ve earned a reputation for helping our Toronto-area clients make their homes more efficient and organized with our luxury storage solutions. We’re committed to delivering customer service excellence and custom-made storage solutions that add value to every space. Contact us to schedule a complimentary in-home consultation and to learn more about our products and services.